While we wouldn’t dream of moving any of our teachers and their class outside, this is a visualization of the only space we have left to grow into. Without a new building, in the Fall of 2019, we will have a class without a classroom. Plus we have a few staff members whom we’d love to have back on campus. We’ve found space wherever we could. Computer labs have become mobile carts stocked with Chromebooks. Singular-use spaces have become multi-purpose. Offices have been shuffled, reshuffled, then given up. We make art where we eat lunch, and practice choir where we dissect frogs. This year, our website was designed in a borrowed basement office off-campus, our curriculum has been coordinated from a converted janitorial closet, and our Director of Development has set up a makeshift office in our utility closet. We have become masters at “making it work,” all the while knowing it was only temporary—just what we had to do until God opened one of the doors we have been knocking on. That time has finally come. The Living Stones Capital Campaign is here. "so•lu•tion•ar•y" a revolutionary, inventive activist who finds and/or creates solutions to significant life problems. A rendering of the new, 12,000 sq. ft. addition currently under construction. 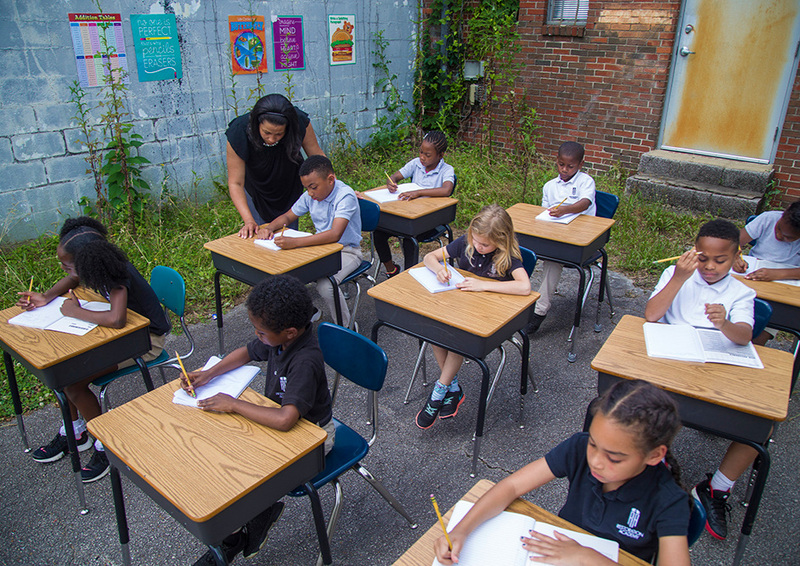 Absent of completely revamping our public school system, Restoration Academy is a very practical solution to the problem. Regularly, we have to turn students away—each year there are students who want to attend RA but are turned away for lack of room. For the past five years, we’ve sought expansion opportunities both in Fairfield and throughout the Birmingham area, knowing that our doubling would eventually require additional space. Each time, these doors have been closed. Led by prayer, we feel the Lord’s calling to remain in our current location and continue to be a light to this community. Therefore, the Board of Directors have decided on a building expansion into our existing parking lot. This 12,000 sq. ft., two-story addition will give us the space we need for future years. In order to accomplish this, we’ve begun Living Stones—a capital campaign which will enable us to grow the school by approximately 200 students. That will make a total of 522 students to which we can offer this holistic approach to education each year. In the past ten years combined, we’ve graduated 143 students. Funding this program will allow us, in the next ten years, to increase that number to 503 graduates, drastically expanding the extent of our influence. WHAT'S IN THE NEW BUILDING? 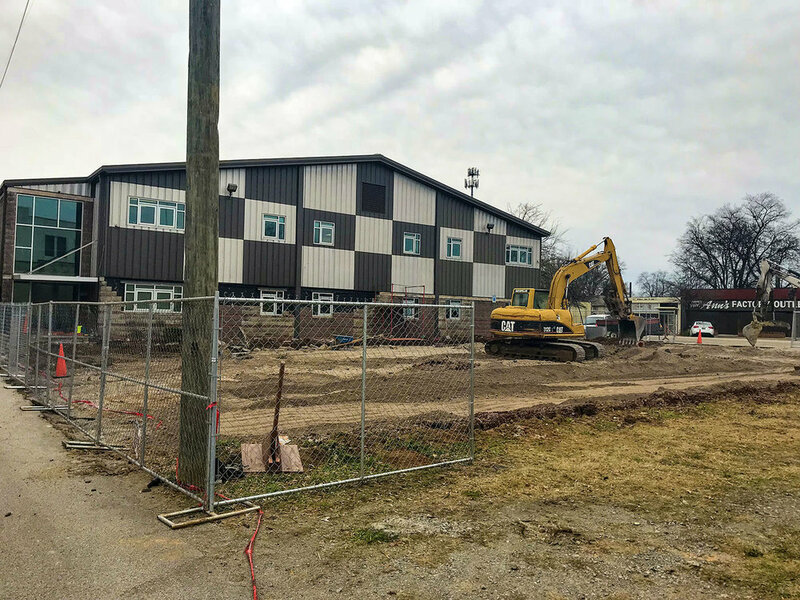 New Classroom space will not only allow us to accommodate more students, it will allow us to be more effective in specializing the spaces for a more hands on, immersion-based classroom. Art has been taught in a variety of spaces in our current high school, but hasn’t yet had its own space. Additionally, this space will allow us to venture into the digital arts. Like the visual arts, music is something that has filled whatever space was available, but is looking for it's own acoustically-designed, dedicated space. Safety is one of our greatest concerns. This expansion allows us to greatly increase our ability to keep the school a refuge for all of our students and families. Collaborative space means our administrators are able to effectively work in proximity to each other and in close proximity to the students we serve. This will be the first time in the history of the school where our volunteers will have space primarily designed for their use. This space will provide individualized places for one-on-one tutoring, as well as flexible spaces for professional learning communities. We have always lacked the intentional space in the halls for students to congregate. Not only will we be gaining wider halls in this new building, we've also integrated places in those halls for students to gather without increasing congestion. The creation of a new main office with a waiting area provides a central entry point for guests to the school as well as a far more functional space for parents and students. In addition to the typical $1.97M we have to raise each year (60% of our annual operating budget), this year we are also tasked with raising an additional $3.5M to meet the goals of the Living Stones capital campaign. This will allow us to build a new building to meet the needs of current and projected growth, and adjust to the increased operational costs with such an expansion. Thankfully, we walk by faith not by sight, and in a mere 6 months—through generous donors, grants and foundations—the Lord has already brought in nearly $3 of that $3.5M. Would you consider helping us close that gap with either a one-time gift or a donation pledged across 1–3 years? Check back here for pictures showcasing various stages of construction up to the present. Sometimes it’s hard to imagine this will all be done and ready for Fall 2019.